The third of the Ten Virtues of Ikebana is appreciating the non-verbal communicative power of flowers. There are two ways to interpret this. Some say that we can make friends through flowers without using any words. The other interpretation is that flowers can give us profound pleasure, which is beyond words. I’ll talk about the second aspect in the next issue and focus on the first this time. The pleasure we find in Ikebana doesn’t need to be expressed in words. When we share this pleasure with other people, we can make friends without using words. 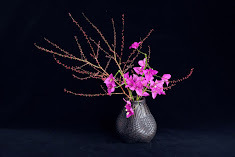 We often feel that Ikebana works “talk about” the artist’s personality. When I am exhibiting my works around Melbourne, many strangers start to talk to me. As I improve my skills, I hope that this will happen more and more. Having said that, I only have a few regular clients in the Japanese community, Hanabishi and Koko restaurant in the city. I’m hoping to find another client sometime soon. The experience of making friends through flowers is rather rare, but in fact many Ikebana artists would certainly have experienced this. I personally have had a few important encounters in my Ikebana life. Seeing works by Ms Marjorie Bromilow in Adelaide was one of them. Immediately after her exhibition I was inspired to learn Ikebana and became her student. I was very sad to hear that she passed away at the end of last year. Seeing Hiroshi Teshigahara’s works was another instance. Making “friends” may not be the best way to describe my relationship with those teachers but in a broader sense they are friends for me. This is a work I made for Hanabishi. The three yucca leaves stand firmly as I divided the inside of the container using a short branch. Between the leaves I inserted other materials, chrysanthemums, daisies and lilies. The form of the leaves emphasize the form of the container. The second of the ten virtues of Ikebana is “selfless mind”. When we face our flowers, we are free from any concerns and we can clear our minds. The first goal of Zen meditation is to achieve such a clear mind, free from the chattering self. This first step is often the hardest for any student of meditation. But with the help of the natural elements in their arrangements, many Ikebana students come to experience this state of mind almost without realising it. However, the important thing is not try to understand such a meditative effect of flower but to actually experience it. If you try making some of the simple arrangements I introduce in this series, you may experience the effect instantly. On the other hand, it may take for a while for you to experience it. As for me, it took almost 6 months to experience that for the first time. Actually, learning Ikebana was initially a rather frustrating experience for me. Even if you can not experience the clearing of your mind now, don’t give up Ikebana too soon. Surely you will experience it sometime in the near future. Then, Ikebana will be an important part of your life. Actually, many people get addicted to flowers, which is much better that getting addicted to drugs or gambling. You would never break up your family through Ikebana. It would be nice to have many flower addicts, who can appreciate the essence of traditional Japanese culture. To create this work I stuck branches of mahonia into a glass container. Then I inserted hydrangea stems between the branches. The distinctive features of the two materials create an interesting effect. As I mentioned in the last article, Ikebana has been defined as symbolic representation of nature. This means that a simple Ikebana work using just one flower can represent the whole universe. “Puppy” by Jeff Koons is a very popular large work of art. He uses flowers to create a dog in a realistic way. In contrast to that, Ikebana artists try to express something invisible, the essence of nature. The Ikebana works convey something we cannot see but may be able to feel. Making this small work, I first made holes on dracaena leaves. Then, I inserted thin geranium flowers into the holes. This is another simple way of fixing flowers. The contrast between flat leaves and fine flowers is focus of this work. What is Ikebana? In the 16th century Iekenobo Senno defined it as the symbolic representation of nature. Rather than focussing on the outward beauty of each flower, the Ikebana artist is concerned with the essence of the flower. Ikebana artists try to express the idea of nature in their works. Even a small work can represent a microcosm of the universe. In that sense, Ikebana is a symbolic art rather than just a nicely arranged bunch of flowers. In this work I used a trivet which is made of the words “Very Hot”. I placed the trivet on top of another pale, then I inserted pine needles, Japonica, and sasanqua camellias. Because of striking red colour of the trivet, this work has a real feeling of celebration. It’s a simple New Year arrangement. I’d like to talk about the ten virtues of Ikebana. Historically many Ikebana artists have been trying to convince people of the worth of Ikebana. The teaching of the ten virtues of Ikebana is a typical example. One of its original forms can be found in a text called Rikka Imayoo Sugata, written in 1688. The first of these ten principles is No Discrimination. Ikebana made it possible for people of different classes to meet. This was quite unusual in feudal times where there were few opportunities for ordinary people to meet people in the upper class. The upper class in those days were generally high class monks and aristocrats. I have personally had many enriching relationship with my students and clients. Ikebana creates opportunities to meet more people from all walks of life and develop a stronger social network. In this work, I used a ball made of thick wire. Placing the ball at the top of the glass container, I can fix spirea and forsythia branches with no difficulty. Introduction: I'll post Introduction for this blog sometime soon. While abstract sculpture became popular in the Western art in the 20th century, Ikebana has been an abstract art since its beginning 500 years ago. This aspect of Ikebana may seem small, but its significance should not be ignored. Deeply indebted to Japanese aesthetics, religion, history and society, Ikebana truly represents a Japanese traditional art. However, Ikebana does not seem to be receiving the recognition it deserves. Probably because there are so many Ikebana artists in Japan, it may have lost its uniqueness. Ikebana has become decorative commodities rather than an art form with rich history and sophisticated theories. In this work I used cross bars to fix flowers. The opening of the container was divided in to four spaces, with each different size. Using only two spaces, various background materials were inserted. Notice their soft textures and light colours, which work nicely with the pink colour of the main flower, oriental lily.